snowdeal.org > ex machina: the eric update - day 220: so long, supersized paci? the eric update - day 220: so long, supersized paci? while there were days not too long ago that we were afraid that odin would be attached to his supersized paci for a very, very longt time, these days he's much more interesting in showing off his new ability to grasp and manipulate objects with two hands than he is in putting it in his mouth. in fact, he'll usually only keep pacified with the paci for a few minutes before he'll let you know that it really doesn't do much for him anymore. 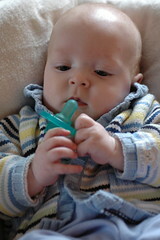 it's fun to look through all the supersized paci photos to get an interesting way to calibrate his growth. I didn't even know such things existed. oh yes. you used to be only able to get them in the nicu and a few other select places and we heard horror stories about parents of preemies who could only be pacified with this particular brand of pacifier losing them and needing to go back to the nicu to beg for a quick replacement. the soothie website refers to them as being "the ones you got in the hospital" so they must have the corner on the nicu pacifier market. in any case, you can apparently get them everywhere these days, including walmart. He's so rapt! I still marvel at how far he's come in such a short time. I spell it incrediblly or stupefyingly. The sheer number of synonyms in the english language has made us all terrible spellers. That happened to us, the paci becoming a toy instead of a tool around Odins age. And then all of a sudden a few weeks back Magdalena started putting every pacifier she came across in her mouth. It's odd. :) So maybe, the S.S Paci will return in a few months.